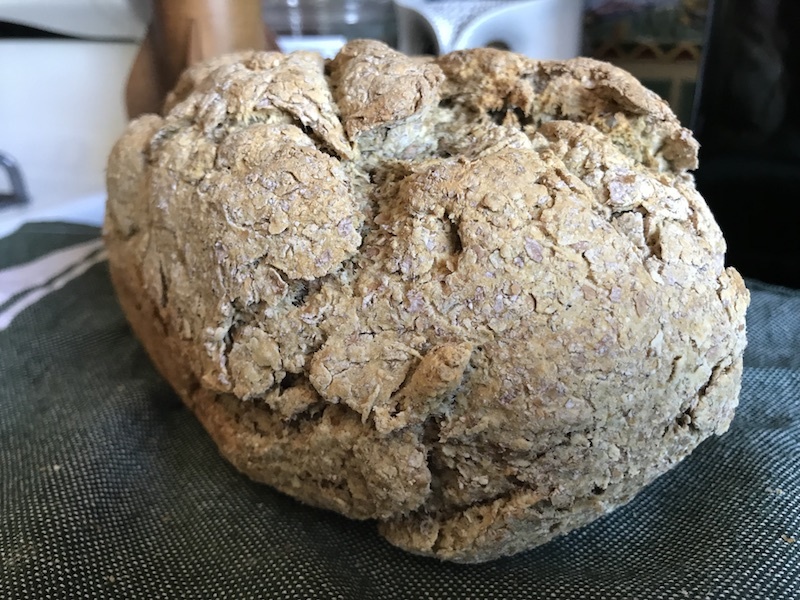 I tried the popular Irish brand Odlum's Irish Brown Soda Bread mix to see if it was better or easier than my standby recipe. Irish Brown Soda Bread is a staple in my home. I make it frequently, using this buttermilk based recipe. I like this variant as it reminds me of the bread I got at breakfast in East Cork. It different, tho not wildly, from what I was served in other parts of Ireland. Out of curiosity, I thought I'd try Odlumn's brand of Irish Soda Bread mix. They have an OWL as their logo, it must be good. The only ingredient you need to add to Odlum's mix is milk. My standby uses buttermilk, but I went with regular milk to try and make what Odlum's wanted me to. The recipe on the bag just requires you pre-heat an oven, measure out a few cups of mix and some milk, mix, form a loaf and bake. There was only one minor complication as I needed to look up a gram to cup conversion rate (135g per Cup of bread flour, so I went with that.) I could have taken out my measuring scale but that really defeats the purpose of a quick and easy mix. I mixed. I formed. I put this 1 pound or so loaf the recipe produces in a 1 1/2 pound bread pan. I baked it for 40 minutes. What came out of the oven looked like Irish Brown Soda Bread. A little more ghostly than from scratch but from the outside, they looked very much same-same. Cutting open the bread you can see the Irish whole wheat is far more coarse than the stuff we get in the US of A. I add some wheat germ to mine, which also imparts a more earthy flavor to the bread in addition to the more rough and crumbly texture. Odlum's is coarse but lacks that bold and fresh taste the wheat germ adds. Odlum's stand-alone is also a bit salty for my taste, but with a bit of butter or cheese that disappears. Buttermilk vs regular milk makes a HUGE difference. The next time I use this mix I'll try it with buttermilk. Eating a piece of the bread made with regular milk gave me hiccups, a very easy reaction to get from me with dry food. Buttermilk makes the bread heavier, more substantial and more moist. MOIST. I prefer buttermilk. Odlum's own website suggests adding nuts to the bread. I like to add nuts and berries. Some of our readers claim I'm nuts for doing this. I would like to let my kid kick them in the berries. I would say the mix saved me about 5-10 minutes of finding the very few ingredients, measuring them, and returning them to my mystery cabinets. If you keep a loaf of brown soda bread on the counter, like I do, I can see turning to this mix every now and then to save some time. The mix lacks the "OMG I'm gonna eat this entire loaf right now" deliciousness of made from scratch, however. It is perfectly fine for some bread, cheese and a cup of tea with my morning emails.